Every job includes a FULL INSPECTION of your property, followed by humane raccoon removal services that fit your specific situation. Our Professionals can clean up & sanitize all raccoon poop. Need new insulation? We can do that too. This saves you time & money. We can help with protecting your property against raccoon invaders. We use the latest techniques available & do all is at a great cost too. Urban Wildlife Trapping Experts always approaches every job humanely. 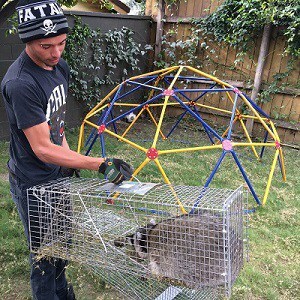 When it comes to Raccoon Removal, we offer Humane Raccoon Trapping & Raccoon Removal Services. Raccoon Removal Services. Do you hear raccoon noises in the attic? Or have raccoons destroying your backyard?. Maybe raccoons got into your crawl space? Or finding raccoon poop in your pool?. Yes, raccoons can become a pest. Tired of dealing with raccoons? If that is you, then my raccoon control company can help solve your raccoon problems for good. We have the experience and know how to make your property free of raccoons. 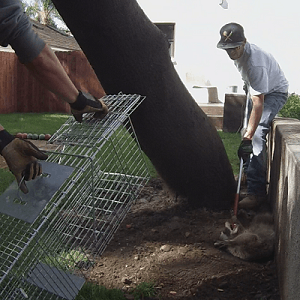 We services Los Angeles County, Orange County, Riverside County, and San Bernardino County for Raccoon Removal. When this happens, many property owners wish to have the nuisance raccoons trapped and removed by Urban Wildlife Trapping Experts. We know how to get rid of raccoons in your backyard or attic. Need Humane Raccoon Removal? Give Us A Call Today! Raccoons love the city life and the food source we provide. They can find food just about anywhere in the city. Your home is the best place for raccoons to nest and find food. Grubs and pets food is the raccoon's main food sources. We recommend working on exclusion work to prevent all these from happening, but will not stop them from coming to your yard. The best solution raccoon control would have to be trapping and removing. Raccoons adapt to most situations. They love to travel and explore without being disturbed. A business is a perfect area since most businesses close after a certain time. Unattended to rummage through the garbage and nest on the most convenient part of the building. They can also access into your business without you knowing. A full inspection is the best response, addressing anything and everything raccoon problems. Raccoon Sounds - Hearing noises under house, attic, or wall? Hear scratching noises in the Attic? Raccoons could be the culprit!. Raccoons and baby raccoons that have invaded your attic, crawlspace, or walls can be loud and frightening. They tend to make lots of noises by making scratching sounds on the ceiling, drywall, or walls of your property. Raccoons also make loud thumping sounds in the attic, by entering or exiting the structure. They can also have loud vocals startling much property owners. Raccoons make chattering sounds, Unlike any other critter. If you are hearing lots of chattering noises in the attic, it's probably a female raccoon with baby raccoons. We can help you identify which animal is making the sounds in your attic space. Not only can we identify raccoon problems, we can also help you with the removal of the raccoons in your attic. Raccoon Damage - What Damage Do Raccoons Cause? We witness daily on how raccoons can destroy yards, soffits, vents, screens and wiring seeking shelter in the structure of your home or building. From raccoons digging in the yard to raccoons in the attic having cute little babies. Raccoons can also cause over thousands of dollars worth in damages to property owners in Los Angeles County, Orange County, and Riverside County. We know from firsthand experience that raccoons do significant damage to properties nationwide. Raccoons are leaving behind urine and feces which can become a health hazard to you or your pets. Raccoon prevention is probably one of the most valuable services you should get done. Raccoons cause damages to your home seeking shelter or trying to nest. We do a thoroughly Inspection of your property to identify all entry/exit points. Our experts can seal up any entry/exit points caused by the raccoon in Los Angeles & Orange County. Exclusion repairs will help you for further prevention of nuisance raccoons. We only use high-grade materials to complete every entry/exit point repair. It is standard all our technicians carry these materials. Prices can vary due to the damage and that every home will not be the same as yours. If you have raccoons is in your attic, you probably have a big hole somewhere. First of all, raccoons love the attic; it provides high shelter away from people and predators. An attic is also a perfect place for a female raccoon to have their young ones. We will thoroughly inspect the outside of the property. In the months of March and August, 8 out of 10 times there will be a Female Raccoons with babies in the attic, this is a very complex case. It involves an adult female raccoon and a litter of baby raccoons. The nest of baby raccoons must be located and removed and trap the mother raccoon. We identify all possible entryways by raccoons oil stains where they have been entering your home over a period. Based on the evidence we find, we will begin repairs. Once the raccoons have been removed safely, Our team can source the entry and exit points. Raccoons can make a mess of your lawn. Their main attraction to your yard/garden are the juicy insects, like grubs or worms. Raccoons can damage or roll back the grass forging for a high in protein meal. I've had many customers that have had these same raccoon problems. And many of them have tried DIY raccoon deterrent/repellents with no results. They always ask, "how to get rid of raccoons in the backyard, how to make raccoons leave, or what raccoons don't like. Home remedy people tried to repel/deter raccoons is motion sensor sprinklers, cayenne pepper, or ammonia. With NO luck, they end up calling us to have the raccoons trapped and removed. Urban Wildlife Trapping Experts can help you remove the raccoon rolling back or tearing up your grass. We will come out to your home or business place and help you take control over your property. Our experts know how to catch a raccoon digging in your backyard or garden. We only setup sturdy humane raccoon traps to capture the raccoons. If raccoons are on your roof, they most likely have an entrance point from the roof into your attic. Most common entry points are builders gap, which the home builders left a gap behind the shingles, eaves or siding. The raccoons can simply pull back the shingles or slip in through the eave opening. 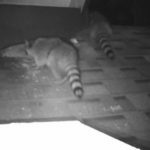 They can also tear a hole through the roof and will lead to excessive damage, like water damage, roof leaks and more activity for raccoons. Another reason raccoons are on your roof is to use it as their bathroom. this is called a raccoon latrine and it's a common call we get. We will definitely need to fortify the roof. If the raccoons are simply just on your roof and not your attic. Raccoon Removal Tip: Try cutting off the raccoons accesses point to your roof top. your can start by trimming tree branches back 3ft from the roof line. This is a common issue overlooked by homeowners. 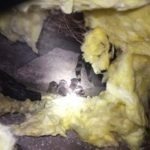 After getting their homes services by the AC company or internet provider, they sometimes forget to close up the crawlspace entrance. Not only that, it opens many doors for raccoons from entering the home. First, we would try to locate other possible entry points. Since an animal has been going in your crawlspace, there is a possible chance that an animal is still there. We would inspect before moving on towards any repairs.